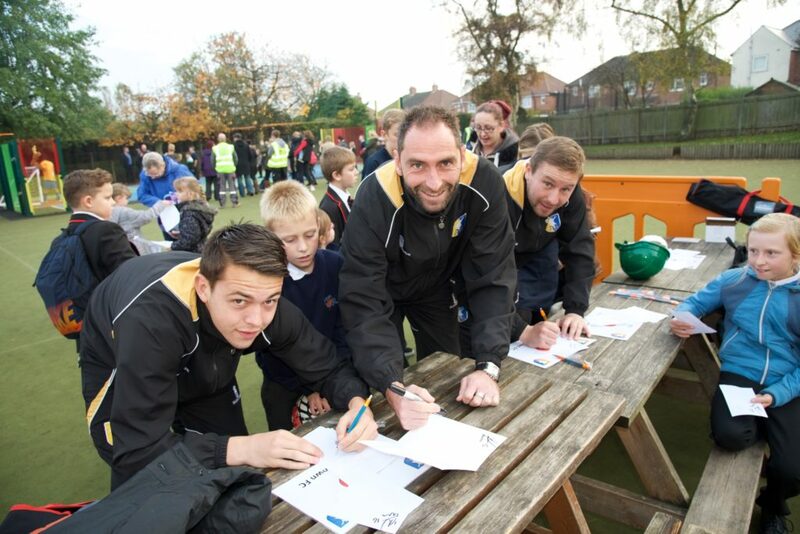 Mansfield Town players Nicky Hunt, Jamie McGuire and Jack Thomas were recently involved in a fun-filled meet and greet day with children at the soon-to-be-refurbished Asquith Primary School. The trio popped in to see the youngsters who would usually be hard at work, while pupils from the school also got the chance to take penalties against Mansfield Town furry mascot, Sammy the Stag. Stags’ director Steve Middleton, who is also the owner of local electrical contractor Lukes & Godwin Ltd, invited members of the squad to come along; the firm are helping Edwinstowe-based construction company, Robert Woodhead Ltd, to carry out a wide range of improvement works on the school that includes replacement roof coverings and new external doors, new fire alarms, lighting and electrical distribution equipment. Stags’ captain Nicky Hunt spoke positively about the day: “We very much enjoyed our visit to Asquith School and hope the children benefited from the experience. It’s incredibly important to get the kids loving football and getting them to games on Saturday. “We consider it a privilege to be able to do things such as this in the local community,” he added. Woodhead also held a drawing competition with the pupils, who worked to design their favourite characters over the half term. The winner will be announced and presented with tickets for the Mansfield Town vs Hartlepool game later this month, which were kindly donated by Lukes & Godwin.